Beck, Kent (1999). Extreme Programming Explained: Embrace Change. Boston: Addison-Wesley. Blood, Rebecca (2002). The Weblog Handbook: Practical Advice on Creating and Maintaining Your Blog. Cambridge, MA: Perseus Publishing. Brooks, Frederick P. (1995). The Mythical Man-Month: Essays on Software Engineering. Reading, MA: Addison-Wesley. Chesbrough, Henry (2003). 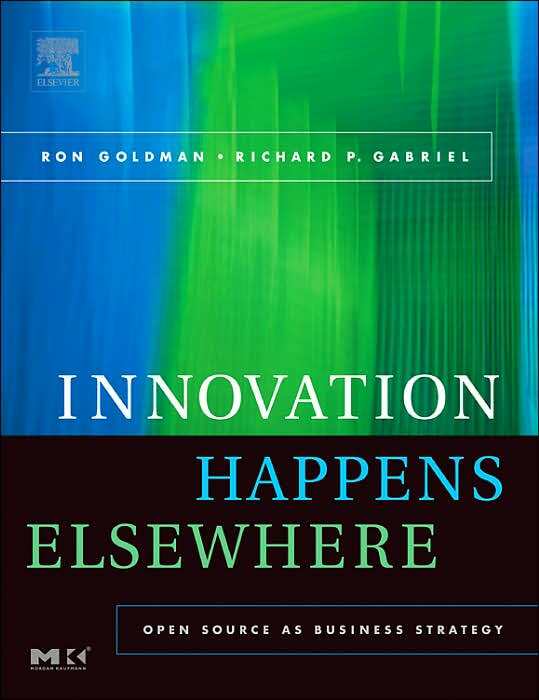 Open Innovation: The New Imperative for Creating and Profiting from Technology. Cambridge, MA: Harvard Business School Press. DeMarco, Tom, and Timothy Lister (1999). Peopleware: Productive Projects and Teams, 2nd ed. New York: Dorset House. Florida, Richard (2002). The Rise of the Creative Class. New York: Basic Books. Fogel, Karl (1999). Open Source Development with CVS. Scottsdale, AZ: CoriolisOpen Press. Freiberger, Paul, and Swaine Michael (2000). Fire in the Valley, 2nd ed. New York: McGraw-Hill. Gamma, Erich, and Kent Beck (2003). Contributing to Eclipse: Principles, Patterns, and Plugins. Boston: Addison-Wesley. Gibbs, W. Wyatt (1994). "Software's Chronic Crisis." Scientific American 271, 3 (September): p.72-81. Hall, Peter (2002). Cities of Tomorrow: An Intellectual History of Urban Planning and Design in the Twentieth Century. Malden, MA: Blackwell Publishers. Hugo, Richard (1992). The Triggering Town: Lectures and Essays on Poetry and Writing. New York: W. W. Norton. Kaplan, Robert, and David Norton (2002). The Strategy-Focused Organization. Cambridge, MA: Harvard Business School Press. Kim, Amy Jo (2000). Community Building on the Web. Berkeley, CA: Peachpit Press. Leuf, Bo, and Ward Cunningham (2001). The Wiki Way: Collaboration and Sharing on the Internet. Boston: Addison-Wesley. Moffett, Charles S., Ruth Berson, Barbara Lee Williams, and Fronia E. Wissman (1989). The New Painting, Impressionism, 1874-1886: An Exhibition Organized by the Fine Arts Museums of San Francisco with the National Gallery of Art, Washington. Seattle: University of Washington Press. Moody, Glyn (2001). Rebel Code: Inside Linux and the Open Source Revolution. Cambridge, MA: Perseus Publishing. Open Source Software Challenge in 2001. (2001). Stanford University Graduate School of Business Case SM 85, Stanford, CA. Petzinger, Tom (2000). The New Pioneers: The Men and Women Who Are Transforming the Workplace and Marketplace. New York: Simon & Schuster. Preminger, Alex, T.V.F. Brogan (co-editors) (1993). New Princeton Encyclopedia of Poetry and Poetics. Ewing NJ: Princeton University Press. Rhodes, Richard (1995) How to Write: Advice and Reflections. New York: William Morrow & Co.
Shah, Sonali (2003). Community-Based Innovation & Product Development: Findings from Open Source Software and Consumer Sporting Goods, Ph.D. diss., Massachusetts Institute of Technology. Steele, Guy L., Jr. (1984). Common Lisp: the Language, 2nd ed. Bedford, MA: Digital Press. Tellis, Gerard J., and Peter N. Golder (2002). Will & Vision: How Latecomers Grow to Dominate Markets. New York: McGraw-Hill. Yates, JoAnne, and Wanda J. Orlikowski (1993a). ``From Memo to Dialogue: Enacting Genres of Communications in Electronic Mail.'' MIT Sloan Working Paper #3525, Sloan School, MIT, Cambridge, MA. Yates, JoAnne, and Wanda J. Orlikowski (1993b). "Knee-Jerk Anti-LOOPism and Other E-mail Phenomena: Oral, Written, and Electronic Patterns in Computer-Mediated Communication." MIT Sloan Working Paper #3578-93, Sloan School, MIT, Cambridge, MA.